Clients tried: 1.0.8.0, 1.0.8.2, all in both 32 and 64 versions plus Java versions. Also I tried the 32 bit versions using wine under Ubuntu. However the client version used never made a difference (expect for the usual limitations of the Java viewer). I am not entirely sure exactly what the problem here is, but when I used 1.0.8.0 after installing Windows 7, I could only use the leftmost 1920x1200 of my displays, ie all of my left display plus part of the middle one. Trying to switch displays on the client side (select full desktop/switch monitor) resulted in the client crashing. I upgraded the server to 1.0.8.2 after reading about some problems, but here another problem presented: I can view the entire desktop area, but the mouse cursor on the server side is stuck on the left side. I can move it up or down, but it's always stuck to the left. This also occurred using the Java viewer. In the end, I downgraded to 1.0.6.5 (32 bit) on the server side and now things work just fine. So in essence, I don't have a problem I need solved right now, since an old version works fine, but since I didn't see anyone else post such a problem and I might want to use future versions, I thought I'd let you know about it/ask me questions pertaining to my problem(s). Last edited by Iasius on 2010-09-09 18:16, edited 5 times in total. with a 2 monitor setup... possible related to the positioning agains the primary (0,0) monitor. I'm not sure what coordinates that would translate to. Monitor #1 and #2 are connected to my first video card, #3 is connected to the second card. Maybe this will tell you something: Using 1.0.6.5, when I connect, I see the #3 plus parts of #1 as described, clicking switch monitor once switches to #3 only, clicking that again switches to the entire desktop area (3+1+2). On the next click, it's #1 only, followed by #3 only and then the entire desktop again. With the Java viewer I always have to select Ignore or Disable for "Cursor Shape Updates", or I get a "Error: Framebuffer update rectangle too large". However that error is present with all versions I've used so far and easily fixable with that different setting for cursor shape updates. The first window size I get using either the vncviewer.exe or the Java viewer is 1920x1200, but it shows the display #3 and part of display #1 first. That's irrespective of versions. It was just in version 1.0.8.0 that the vncviewer.exe would crash upon "full desktop/switch monitor". That doesn't happen in either the earlier or later versions. As for the mouse modes, I suppose you're referring to "track remote cursor locally", "let remote server ..." etc? If so, that made no difference with the 1.0.8.2 problem. I could move the client side mouse cursor just fine (obviously :-)), but the remote cursor would stay at the left side of display #3 and "flicker" if I move the client side mouse, moving up or down with it, but always staying at the far left. Last edited by Iasius on 2009-12-10 02:00, edited 4 times in total. Please check also if the screen order is related to the bug. (1) is the primary display and topleft is always (0,0), if you place the (1) as most left screen (2) and (3) have also positive coordinates. Do you scale the screen on the viewer site? Could also be the cause of the bug. I have a similar issue with dual monitors on windows xp. I also have a reverse order; Left monitor is #2 portrait, Right is #1 landscape. Was fine with 1.0.8.0 but when upgraded to this version, mouse will only stay along the left side of monitor #2 no matter if I am accessing #1 or #2. There where a lot of crashes caused by the mouse positioning. For next update the multi-monitor part require a full review. I won't be able to test this today unfortunately, but I hope to be able to do this by/on the weekend. You've said that the next version already requires a full review, but I hope I can provide you with some hints during my tests. Specifically, I'll test versions 1.0.8.0 and 1.0.8.2 regarding a two/three monitor setup and the placement of those displays. All I can answer so far is that client side scaling was always set to 100% in my tests so far, (I always leave server side scaling at 1:1). I'll try and see whether client or server side scaling makes a difference. My suspicion is however that it's a server-side problem. I also want to take this opportunity to thank you for your efforts in developing UltraVNC. Personally, I mainly use FORTRAN to solve physics problems, so I can't exactly help you on that side. Last edited by Iasius on 2009-12-10 16:34, edited 3 times in total. This version did not fix the issue I see. Mouse will only move top 3rd of left most side of the left monitor (#2). this did the trick for me aswell. dualmonitor, secondary left to primary. Win7 ultimate x64. Two monitors, primary to right. When viewing primary monitor, it is fine. Click button for full desktop/switch monitor toggles between primary screen and full desktop. In full desktop, attempt to use secondary (left) portion of the screen is completely unstable, with elements of the primary screen coming and going. Another dual monitor issue WITH video hook, may only happen when primary is to the right? Both monitors active, tool tips (text that appears next to mouse) does not back fill right. When the tip goes away, a piece of screen from the right UNDER the active window fills in. Deactivate second monitor, and it's fine. njudell wrote: Win7 ultimate x64. Two monitors, primary to right. When viewing primary monitor, it is fine. Click button for full desktop/switch monitor toggles between primary screen and full desktop. In full desktop, attempt to use secondary (left) portion of the screen is completely unstable, with elements of the primary screen coming and going. Win7 enterprise x64, two monitors 1600x1200 primary on the right side. I can confirm this in parts. After switching to full desktop on the client, a black screen appears on the right! side of the clients display, while still showing the servers primary(right) display on the left, and windows from the servers secondary display come and go. Dual Monitor, Win 7 Ultimate 32 bit. Mouse clicks not recognised from XP remote. Uninstalled 1.0.8.2 server and installed 1.0.6.5 instead - all OK. Except only primary display visible from client! When I first connect, the first monitor I see is the secondary (left). Also, I keep my left in portrait, right in landscape. The view is the left in landscape, the bottom is chopped and the right is part of the primary on the left. Basically take a landscape box and start in the upper left of the secondary on the right. Select the desktop button and it becomes the full desktop but with draw issues as stated prior. Last edited by bumforaliving on 2010-01-10 01:01, edited 1 time in total. I have tested this also, In the mirror driver the same problem seems to occur. When using the mirror driver, when moving the mouse cursor over the left monitor (monitor2) it leaves traces (blocks if you will) of the right monitor (monitor1) in its wake. So picture the left (monitor2) empty, and a filled right one (monitor1). Moving the mouse on the left screen slowly in a pattern will leave the right monitor on the screen of the left monitor. This only when using the video mirror driver. Without it, everything works like a charm with this new version. This fix worked for me, thanks! Mouse tracking properly now with fixed version. I would like to confirm that this new version posted by Rudi (#10) fixes the issue for Windows Server 2003 for my primary display on lower-left quadrant and secondary on upper-right quadrant. My symptoms were the remote mouse stayed on the top part of my primary display. I can't see dual screens in a single click session. Is there any fix for that? You obviously lack the creative genius to integrate Legos and Duplos. 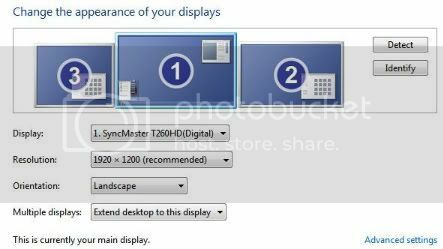 My secondary display (1024x768) on the right is placed about 200px higher than my primary display (1680x1050). Ultravnc maps (0,0) as top left corner instead of (0,200), so it's showing the top 200px of screen as black and cropped the lower 200px when I connect to it. I'm not able to see or click the start button. This build fixes the mouse but didn't fix the screen mapping for me. Last edited by IrishBAM on 2010-02-06 00:34, edited 1 time in total. IrishBAM wrote: This build fixes the mouse but didn't fix the screen mapping for me. Last edited by redge on 2010-02-06 15:30, edited 1 time in total. Same after I did that. Last edited by soCram on 2010-02-11 12:58, edited 2 times in total. I also have a similar issue, however for me it's the server that crashes (I believe the client just closes). Interestingly, it sometimes works fine - seems like for that session, but other times it just crashes every time I swap to the second screen. It's slightly less painful now because the service seems to restart itself automatically (which is nice), but still, annoying because you have to try 3 or more times sometimes to get a 'good' session where it will work. Edit: Tried the updated winvnc.exe and that resolves the issue. It would be nice to still have the option of displaying the 2nd screen by itself however. Last edited by SamboNZ on 2010-02-22 12:01, edited 1 time in total. It looks like it's the positioning causing it as Rudi said above. still, no secondary monitor viewing ?